Filamentous polymers called microtubules play vital roles in chromosome segregation and molecular transport. 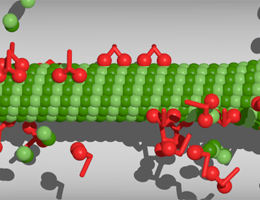 An LMU team has now examined how microtubule lengths vary in response to changes in the availability of their protein components. Cells possess an internal skeleton, which enables them to alter their form and actively migrate. This ‘cytoskeleton’ is composed of a number of filament systems, of which microtubules are one. As the name suggests, a microtubule is a cylinder. Its wall is made up of 13 protofilaments, each consisting of heterodimeric subunits containing two related tubulin proteins. Microtubules not only confer mechanical stability on cells and help to dictate their form, they also serve as an intracellular transport network. Furthermore, microtubules are the major constituents of the mitotic spindle, which mediates the orderly segregation of the replicated chromosome sets into the two daughter cells during cell division. All of these functions require dynamic regulation of microtubule lengths. A group of LMU physicists led by Professor Erwin Frey, in collaboration with Professor Stefan Diez (Technical University of Dresden and Max Planck Institute for Molecular Cell Biology and Genetics, Dresden), has now developed a model in which the motor proteins that are responsible for the transport of cargo along protofilaments also serve to regulate microtubule lengths. The model is described and experimentally validated in the journal Physical Review Letters. In earlier work, Frey‘s group had shown that the density of molecular motors attached to the filaments has an impact on whether the microtubule grows or shrinks, and that their effect depends on the length of the filament concerned. The longer the microtubule, the greater the number of motor proteins it can accommodate. Motor molecules called kinesins proceed along the protofilament, stepping from one dimer to the next. When a kinesin protein reaches the end, it detaches from the filament taking the tubulin to which it is bound with it. Consequently, if the motor density on the protofilament is high, shrinkage will continue. On the other hand, a new tubulin dimer can bind to the end. At the end, motor-dependent shrinkage thus competes with microtubule growth. “Hence, assuming that resources (i.e. both tubulins and molecular motors) are present in access, there will be a filament length at which the rates of growth and shrinkage balance out,” says Matthias Rank, first author of the study. However, in a real cell, these components are unlikely to be available in unlimited amounts. For example, formation of the mitotic spindle significantly depletes the numbers of free tubulin molecules in the soluble phase of the cytoplasm. In the new study, the researchers explored the effects of such resource limitation on the regulation of microtubule length. Using simulations based on a mathematical model of polymer dynamics, they found that under these conditions two distinct mechanisms of length regulation come into play. Which of these becomes dominant depends on the relative concentrations of the tubulins and the motor proteins: In a certain concentration range the dynamic equilibrium between growth and shrinkage of the microtubules operates as it would if resources were not limiting. “But things are different when one of the required resources is in short supply”, says Rank. “That is the case, for instance, when not enough motor molecules are available to trigger rapid depolymerization of the protofilaments.” In this situation, the microtubules continue to grow until the concentration of tubulins falls below a critical value. Furthermore, there is a concentration range in which both processes are active. “In this case, we observe that the microtubules come in two sizes and that they sometimes switch between the two lengths”, says Frey. “In physical terms, this can be described as a phase transition.” In vitro experiments carried out by their co-author in Dresden have confirmed the existence of this transitional regime predicted by the Munich model. The team is convinced that their results are also applicable to other polymer systems, and they suspect that the limitation of key resources may play an important part in regulating other cellular processes.